Puducherry (Pondicherry) is a quaint little town situated on the southern coast of India, with beaches overlooking the Bay of Bengal. Built during the British rule, it was the French colonists that shaped the personality of this place up until 1954. Pondy, as it’s fondly called, is lined with vintage villas, townhouses and colonial-style architecture. Further inlaid with perpendicular streets and tree-lined boulevards, there is a very noticeable French influence even today. There are plenty of places to see in Puducherry – be it the beautiful beaches, the brimming botanical garden or the unmissable Immaculate Conception Cathedral, to name only a few. Puducherry is accessible to all nearby states and districts by bus and train. The closest airport is in Chennai, about 150 kilometres away, and happens to be the most-travelled route to the place. 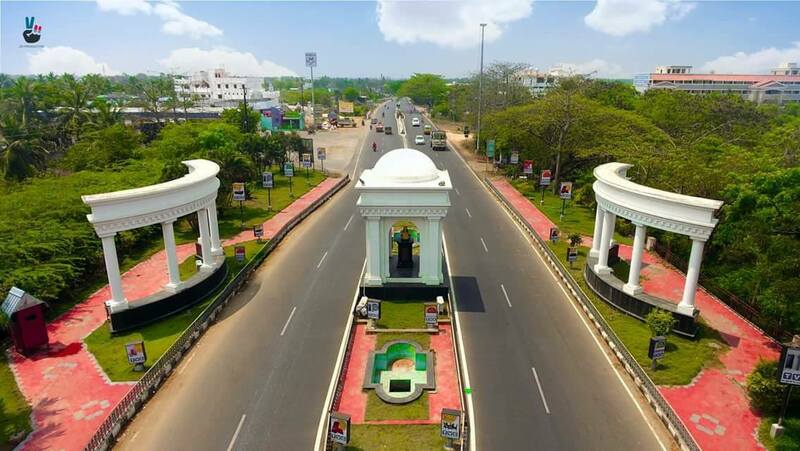 The union territory of Puducherry constitutionally comprises of the districts of Karaikal, Mahe, Yanam, and the former French colony of Pondicherry. As such, the place is rich in diversity; culturally expressed through its architecture, streetscapes and people. In line with its Indo-French influence, there are two distinct settlements – Tamil and French. With a more laid-back feel, this pristine place lets you indulge in leisure activities. You can enjoy a long walk on the beach road or promenade – or rent a bicycle and experience a beautiful sunrise or sunset. You can also learn more about the history of this gorgeous place by venturing out on a heritage tour. The French Quarter or ‘White Town’ reflects some of the finest architecture the township has to offer. Puducherry is also home to the renowned Shri Aurobindo Ashram. Popularly known as Auroville, tourists from all over the world come here seeking yoga, meditation and spiritual enlightenment. The ashram serves as the spiritual heart of ‘Pondy’. With a plethora of cafes at your disposal, you’ll find mouth-watering cuisines in cozy settings, usually uplifted by karaoke nights on weekends. For those of you looking to shop, you can invest in some scented Ayurvedic products and artistic handbags, mugs and paintings. Puducherry has most recently become a hotspot for scuba diving and surfing. A charming conglomerate of French and Tamil culture, which is further infused with history and spirituality, Puducherry provides an inherent mix of pander and poise. There are considerable staying options available, right from modest promenade-facing guesthouses, home-stays and ashrams to the higher budget heritage homes. However, there is a visible dearth of beach resorts here. If you’re on the lookout for a comfortable stay, look no further than the Club Mahindra Puducherry Resort in Tamil Nadu. One of the best resorts in Puducherry, this sea facing, glass-covered, eco-friendly resort offers spacious rooms and splendid views. Equipped with a host of modern amenities and entertainment activities, your family vacations will never be the same again. Also, read through these Club Mahindra reviews & get a sneak peek of why Club Mahindra members love vacationing at this resort in Puducherry! This entry was posted in Puducherry and tagged pondicherry travel tamil nadu, puducherry tamil nadu, puducherry travel tamil nadu india. Bookmark the permalink.